In all of my early films, it was as if I were creating the film in the small compendium that held the filters and mattes in front of the lens. I moved the focus between the extreme nearness of the colored filters and the scene in front of the camera, and as I changed the exposure, the mattes-shapes appeared and disappeared. Through these manipulations both inside and in front of the camera, the image began to breath, and this eventually suggested a more appropriate use of sound. At the center of my earlier films, I had often placed an isolated male figure, juxtaposed against a prismatic abstraction of colors to suggest particular states. Later, I decided to replace these figures by filming myself as filmmaker and to balance the view of a city or landscape with that of myself, filming. The first film of this type was Diminished Frame (1970) with its black & white images of West Berlin and views of my hand(s) placing colored filters inside the camera. The starting point for From the Notebook of… was more complex. I began to prepare a film inspired by Leonardo da Vinci’s notebooks and by my reading of Paul Valéry's essays on Leonardo's creative method. 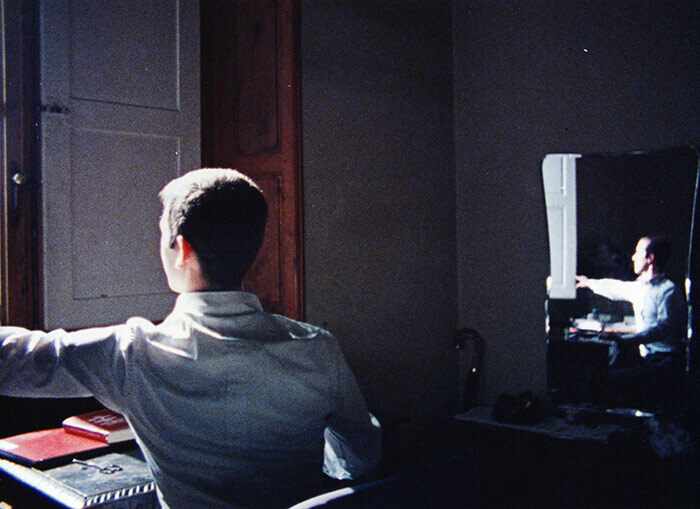 Through Gregory Markopoulos's commitment and the generosity of the painter-filmmaker Silvio Loffredo, I was able to live in Florence for several months. My reading of Vasari's Leonardo biography led me to my first location and the scene of doves being set free from a shop next to the Bargello. The flight of doves is carried forward in the turning pages and juxtaposed to my opening of a window onto the Florentine rooftops. Starting with the bird’s wings and my turning pages, the sound develops through a variety of image/sound metaphors. I am an observer in these various locations, quickly gathering image and sound in darting movements then returning to my room and reflecting on the details, placing them with my notes. There is a graphic development of the film frame as page. I used the mattes to superimpose diverse elements of color, text, sound and image in one composition. The matte in front of the camera plays between the horizontal notebook and the vertical window, turning like a page or window shutter. One of the central points of inspiration for me was Leonardo's observation of shadows. I used the surface of my notebook and desk to translate some of his observations into film and also discovered the shadow as a place for sound. Both the matte and shadow are vehicles that join together diverse details of image and sound. I realized later that my written notes place the spectator in the position of a reader while seeing the film. There is a constant movement between the different way of seeing images and reading a text. The film is also a hybrid between silent and sound film because, when we read, we are creating our own subjective sound in reading, and each of my written notes in the film may become an occasion for the spectator to reflect with his or her own voice. Towards the middle of the film, I placed a Bolex camera on my table, and its aperture becomes another threshold for sound. The whirring camera shutter joins the rushing water of the Arno, or the click of the single frame mechanism becomes the tapping of a hammer, and because Leonardo was also a musician, I added a few notes of the viola. As the film progresses we pass from the apparent stillness of reading to seeing movement through the rhythm of editing; the counterpoints and juxtapositions within the page establishes the film's rhythm.